The objective of this study is to test whether there is a difference between the polysomnographic (PSG) values of Apnea–hypopnea index (AHI), minimal oxygen saturation (SpO2), oxygen desaturation index (ODI) and arousal index recorded on two consecutive nights (so-called “first night effect”) in patients with sleep-disordered breathing (SDB) and concomitant upper airway pathology. 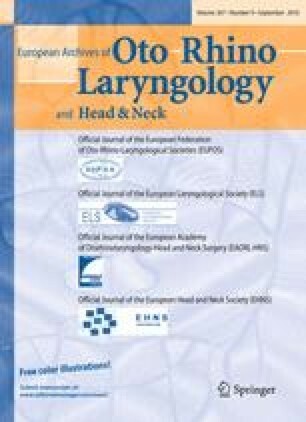 Retrospective case–control study of polysomnographical recordings of 130 patients (112 males, 18 females, age range 23–80 years) with SDB and upper airway pathology who were tested on two consecutive nights in a hospital sleep laboratory was conducted. Only patients with upper airway pathology without other medical conditions causing SDB were included. AHI, minimal SpO2, ODI and arousal index values of the first night were compared to those of the second night using Wilcoxon’s test. There were no significant statistical differences between AHI, SpO2, ODI and arousal index values (P = 0.130, P = 0.640, P = 0.052, and P = 0.692, respectively) between the two nights. However, 15% of the patients showed significant variability in the AHI between the two recordings and in 6% of the patients, a diagnosis of severe OSA (AHI > 10/h) would have been missed if only one night of sleep study had been performed. In general, one night of sleep study is sufficient to lead to a clear diagnosis of severe OSA in patients with sleep-disordered breathing and upper airway pathology but may still not diagnose 6% of the patients with severe OSA. Additionally, 15% of the patients showed a significant variability in the AHI between the two nights.